Manchester City forward Nolito says his "daughter's face has changed colour" because of the English weather in the 11 months since he signed for the club. Nolito, 30, has made just nine Premier League starts since joining City for £13.8m from Celta Vigo last July. He has struggled to adapt to life in England and said he wanted to leave. "I've learnt little English. It's hard. Just 'tomorrow', 'good morning', 'good afternoon' and a little more," Nolito told radio station Onda Cero. He added: "My daughter's face has changed colour - it looks like she's been living in a cave." 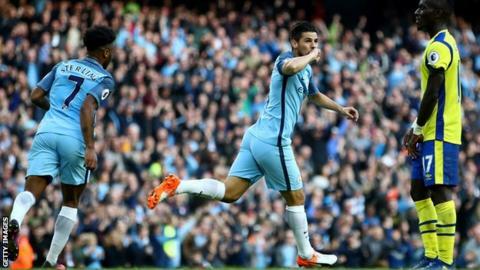 Nolito, who signed a four-year contract with City last summer, has scored six goals in 30 games in all competitions, but his last Premier League start was a 3-0 win away at Hull City on 26 December. "I am under the contract, so the club will decide, but I want to leave," he said.